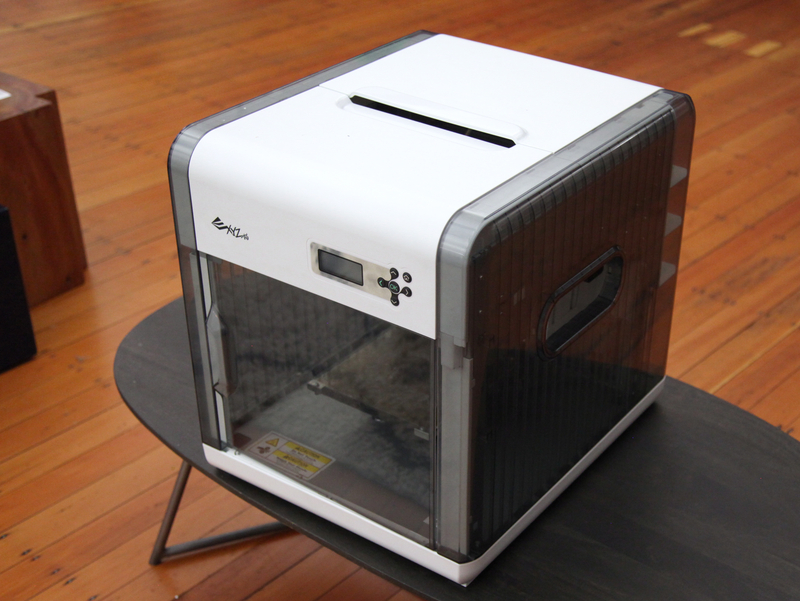 Crowdfunding sites have been teasing us with inexpensive 3D printers for a year now. But in the end the first modern desktop 3D printer that costs less than $500 came from Taiwan, not Kickstarter or Indiegogo. Two of the best prints I got off the Da Vinci 1.0. I wasn’t expecting a whole lot from a $399 3D printer. But the process I had to go through to get it up and running for the first time managed to set my expectations even lower. The first printer that arrived turned on just fine. I installed XYZprinting’s proprietary filament cartridge in the back corner, where it makes contact with a chip to ensure you’re not using off-brand filament (hint: there are some ways around that). Then came the annoying part: feeding the filament into the print head. It involves pulling on an uncomfortable-feeling lever and then carefully guiding the filament down through a tube to the nozzle. I got better at this as time went on, but at first I wouldn’t feed enough in or would push so hard that the filament string snuck off the tube into a random part of the head. It can be aggravating. Next you swab a glue stick over the print bed and hit print. It turned out my annoyances were not over. The print head rammed itself into a corner and made the dreaded “EH EH EH EH EH EH” noise. I couldn’t figure out a fix. A very kind XYZprinting customer service representative walked me through how to test the different sensors in the machine that position the print head, but nothing helped. I sent the printer back. The next printer seemed to be better. The print head moved well and everything seemed to be going smoothly. 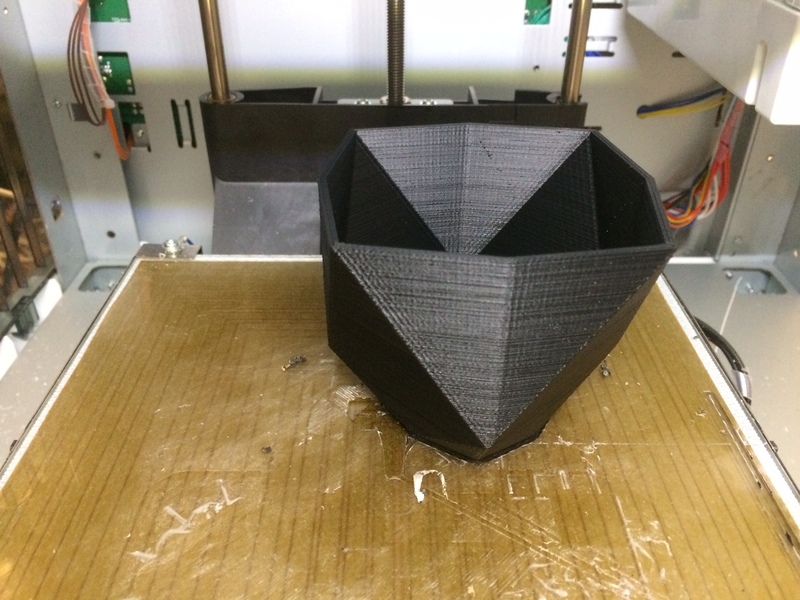 I teed up my first print and then … nothing. No filament came out of the nozzle. It turned out there was a terrible filament jam. The kind representative once again walked me through every little technical step. I opened up the print head and yanked out a plug of red plastic. All set, right? Nope. The print head refused to pull filament in. XYZprinting sent a replacement head. Finally, with my second printer and third print head, everything started working. 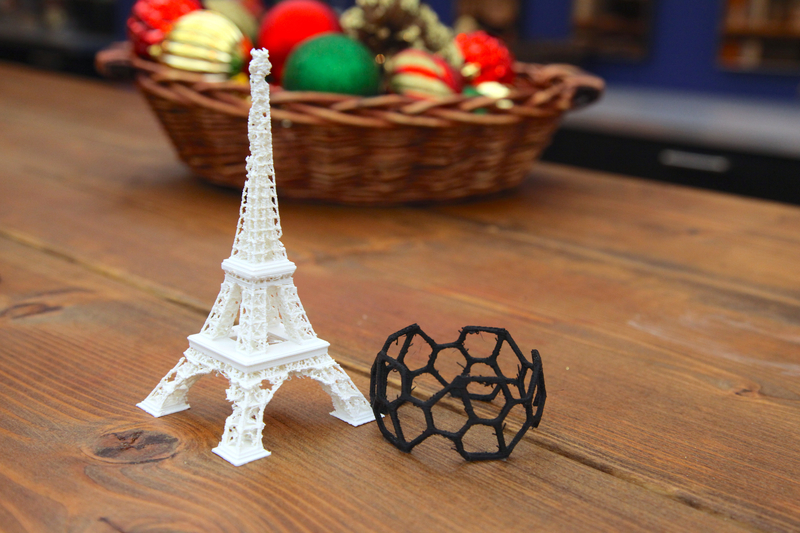 XYZprinting’s software, XYZware, isn’t much different from the 3D printing software people were using five years ago. It is not refined. It does the bare minimum: resizing models, moving them around and sending everything over to the printer. Once you get to finalizing a print, it gets worse. Slicing, where a model is converted into the code that will be fed into the printer, often randomly failed. And even if models did slice, sometimes transferring them to the printer didn’t work. This happened especially often with large prints. Large prints would inexplicably fail to be sent to the printer. When I asked XYZprinting about the errors, they said the model printed fine for them and that I should try a different computer or a different USB cord. Neither worked. The Da Vinci is enormous, measuring 18.4 x 20 x 22 inches and 57 pounds. It does pack a relatively large 7.8 x 7.8 x 7.8 inch build volume, but for the most part the machine seemed to be wasted space. There were inches of extra room on every side of the print bed. Due to the previously mentioned software problems, I never got anywhere close to using all of that space in a print. The printer is also one of the ugliest I’ve come across. 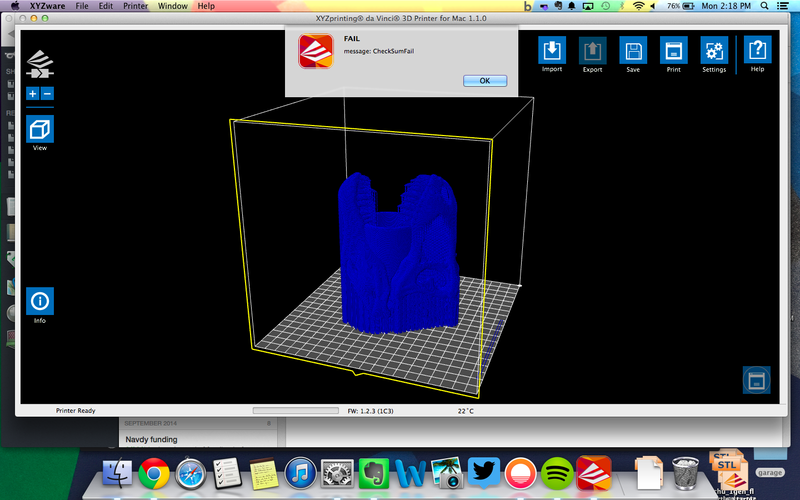 XYZprinting’s model is to get lots of printers out quickly and cheaply, and it shows in the Da Vinci’s design. It is not a piece of desk candy. XYZprinting did not, however, skimp on designing the necessities. While the Da Vinci’s heated print bed and head look generic enough to be found in any inexpensive printer, both were made well enough that I did not have to calibrate them once. 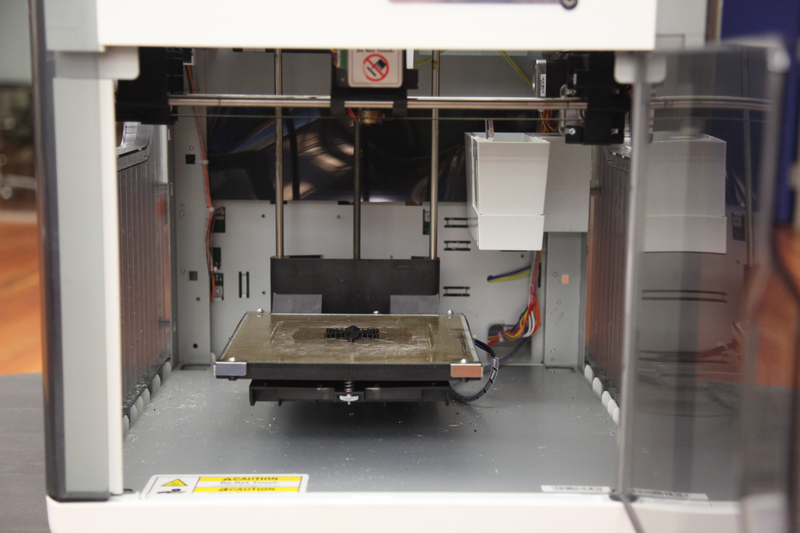 The Da Vinci does have some extra features, such as a small box where the nozzle cleans itself before and after each print. This made clogs and other nozzle maintenance almost nonexistent. The on-board menu is basic. You can use it to direct the printer to clean the nozzle or recalibrate, pause a print and load a new filament cartridge. I was pleasantly surprised by the quality of the prints that came out of the Da Vinci. After dealing with setup and the software, I wasn’t expecting to get any prints out of it at all. But I did, and lots of them. Charmanders printed at low, medium and high quality. The printer had days where every single print was perfect and days where it couldn’t be bothered to do anything right. Large prints tended to come out nicely, while dainty details ended up looking like messes. A dainty Eiffel Tower and bracelet did not come out well on the Da Vinci 1.0. 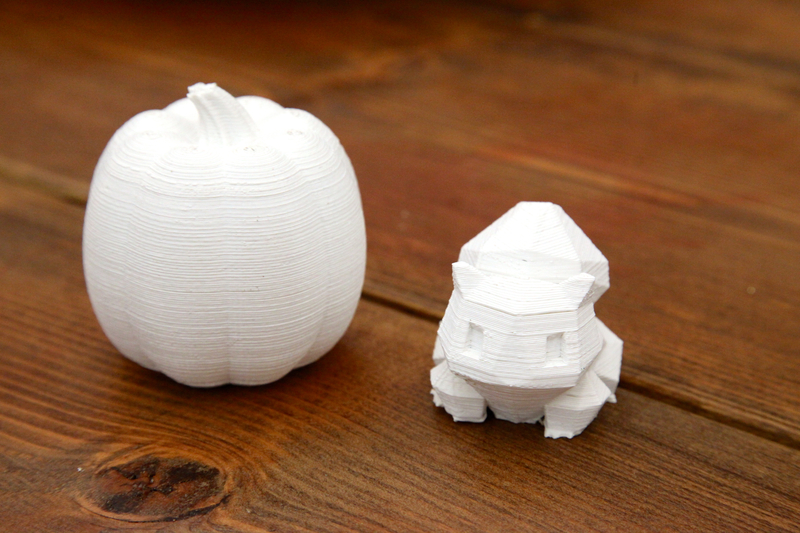 The Da Vinci can print layers down to 0.1 mm in size, which is fairly standard for any desktop 3D printer these days. When layers were continuous — without tons of tiny details — it did great. It was even more reliable when printing at 0.2 and 0.3 mm heights. A thin pot printed on the Da Vinci came out perfectly. The Da Vinci 1.0 is the perfect example of “you get what you pay for.” If you don’t get a lemon, it can definitely produce decent prints. You just need to learn what it is capable of and choose prints that fit within those limits. Personally, I wouldn’t buy the Da Vinci just based on its size alone. There are plenty more $500 printers that will arrive in the next few years. Hopefully at least one of them won’t eat up an entire desk. Good information. Note that I have a 3000$ makerbot 2X and I deal with extruder clog and prints not sticking to the heated bed daily, so Da Vinci 1.0 for $500 is worth a shot if the print quality is decent. Picked up this printer to work with Autodesk inventor lt. Works great for me, and I have absolutely NO idea why the author has an issue guiding the filament through to the print head. All in all it’s not a $3000 Makebot, but you will find your self quite pleased with this printer. Always waiting for inexpensive printers, it will be consumer’s choice. Very cool. Had no idea you could get one of these so cheap so soon… thought we were a few years out.